Nowadays it’s hard to enjoy the great outdoors without consequences on your skin due to the damaging rays of the sun. Thanks to skincare products like sunblock lotions, that won’t be a problem anymore. One of the sunblocks out there that you can choose from is the Avon Sunblock Lotion with PA +++. This product is one of the few sunblocks that has a high rating of sun protection. The PA in Avon Sunblock Lotion indicates its capacity to shield your skin from the detrimental UV rays. The + symbol signifies its potency or strength. 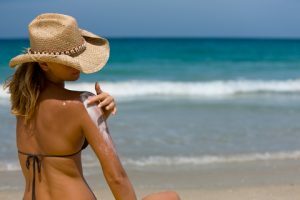 Sunscreens typically have PA ratings up to 1-3 plus signs. The higher the number, the more effective it is in protecting your skin from the sun. According to Avon, this sunblock lotion has been tested and approved by experts. It is also been deemed suitable for people whose skin are sensitive. The concentration of the product is light, which feels comfortable when applied to the skin as there’s no sticky feeling. It is also water-resistant. This means you can fully enjoy your leisure time at the sea without the consequences of skin damage because there’s Avon Sunblock Lotion to protect your skin from the sun. As claimed by its company, Avon Sunblock Lotion will sustain its heightened SPF shield rating even after more than an hour (80 minutes) of being exposed to the sun while swimming. The SPF protection also remains despite sweating. Avon Sunblock Lotion consists of Aloe Vera, which moisturizes the skin. This ingredient helps not only to enhance your skin’s external look, but also its internal condition. It is also asserted that this sunscreen has been tested and approved as safe to use on sensitive skin by dermatologists. The high PA+++ rating guarantees that your skin has optimal shield from the damaging rays of the sun, such as its UVA and UVB. Avon Sunblock Lotion is also light on the skin and is not sticky, so you’re comfortable when you apply it. It is also resistant to water and sweat, making your protection lasts despite some environmental and physical factors. Lastly, it is non-comedogenic and it can also enhance your arid and peeling skin. Avon Sunblock Lotion is quite simple to use. It is also claimed to be guaranteed safe to use on all skin types. Put the sunscreen on your palm and apply it in all areas of your body that need protection from the sun. You’re also not required to re-apply frequently because Avon Sunblock Lotion can last up to 80 minutes even on water. Aloe Vera has already been mentioned as one of the ingredients. 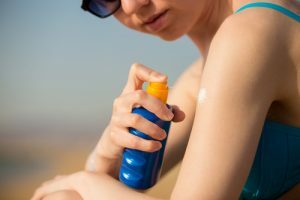 There are more, which includes water and some compounds with properties that are effectual in preventing UVA and UVB rays from damaging your skin. Some of these components are Acrylates and Carbomer. Just like other products of Avon, this sunscreen lotion is reasonably priced when compared to leading brands out there. Considering its duration of effectiveness and high SPF rating, Avon Sunblock Lotion is worth every penny. There’s the safety and efficiency without needing to spend much. Additionally, Avon Sunblock Lotion has a shelf life of three years, so you can definitely use it again come next summer. Avon Sunblock Lotion comes in a blue bottle with an easy to open flip top. Its container is designed so as to be conveniently mobile. This way you can bring it with you anywhere your adventurous spirit brings you. You can also place it in medicine cabinets as it fits in most of them. Avon Sunblock Lotion has a lightweight consistency that you can apply expediently into your skin without getting all messy. Its scent is also gentle to the senses and nothing extreme. The scent actually fades away shortly after putting it into your skin. The product has been tested by dermatologists and is safe for use, so there shouldn’t be any negative reactions even for people with sensitive skin. On the other hand, Avon Sunblock Lotion is not apt for those with oily facial skin tones, specifically if there’s make-up. Its formula may be thin and non-sticky, but it could trigger clogged pores and breakouts when applied on the face with cosmetics. Avon Sunblock Lotion has an SPF rating of 40 PA+++. This is more than sufficient to shield your skin from UVA and UVB rays. Its mild scent instantaneously fades away. This sunscreen product is dermatologist-tested. Its compact size makes it suitable for traveling and adventures. The price is reasonable considering the protection you get from the sun is more than enough. Avon Sunblock Lotion is a great product that’s excellent when spending your time at the beach. It is reasonably priced considering its high SPF protection. However, this isn’t ideal when you have an oily face or if you’re wearing make-up. But if you’re face is not oily and makeup-free, then Avon Sunblock Lotion is worth considering.